The beauty of this beauty is multifaceted. First, it is knit in the round (no purling!). 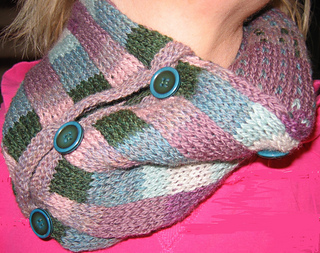 Second, it is reversible, showing a different pattern on each side. Third, because it is stranded and knit it the round, it is four-times as thick with warm, cozy wool comfort than an ordinary cowl would be. Its versatility is also a plus. The knitter can decide how long to make it, and by adding two rows of buttons, she can make it snug as a neck warmer (the extra length tucked inside the cowl), or button on the end for a longer cowl. I LOVE this one! Please visit my Ravelry group ColorworksByDebi Deborah Tomasello Designs . If you would like to be informed of future coupon code promotions, please pm me your email address or email me at Coedeborah@aol.com.